Precision for your coffe brewing. 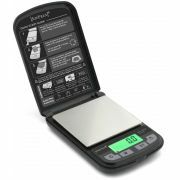 Buy a precision scale, coffee measure and a timer for weighing and measuring the coffee and water for your perfect brew. A scale with a 0,1 gram precision is essential for brewing coffee. With a scale you can measure the right amount of coffee and water. Many scales include a timer for timing your brewing. We have specially designed Hario V60 scales, and also scales from Acaia designed which are a favorite of many professional baristas.